As we rapidly move towards a more hyper-connected future, it’s becoming increasingly important to think beyond mobile – while talking about building applications – in order to deliver adaptive and personalized experiences that are not limited to by device constraints. In other words, more and more is required to develop intelligent apps that can assist users in making accurate predictions and choices based on the historical and real-time data of a user. Intelligent apps promise to further enrich customer experiences by providing businesses the opportunities to adapt to their rapidly changing needs and ways of engaging with them. Gartner predicts 21 billion “things” will be connected to the internet by 2020 and all exchanging data 24×7. Because of this, we will also see an increasing need for businesses to respond to events as they happen. Intelligent applications could be the suitable solution. 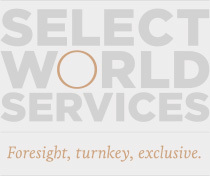 JOIN the executives in the group below for senior-level conversations, exchange of ideas and networking at Select World Services’ Exclusive, intimate, by invitation only CXO dinner – Intelligent Applications. Select World Services (SWS) is a global, full-service event company offering complete 100% turnkey event planning & management services, programming & production, entertainment & special event coordination, and event promotion. Our services are available throughout the globe to assist companies in delivering highly-effective, result driven events, proven to deliver ROI. SWS works with global companies to achieve strategic objectives and delivers events which will save organizations time, money and resources. We pride ourselves on a high quality, executive approach to deliveries. Our experience and reputation for excellent customer service and returns on investment make us stand out from the competition. The premier CxO dinners provide a platform for senior level Executives around the globe to come together in an intimate, controlled environment to exchange ideas regarding particular topics that are of immediate interest.